My next European adventure has begun, and for the next 10 days I’ll be singing and serving alongside my church in Alba Iulia, Romania! I’m excited to announce several fantastic guest bloggers will be taking over Southern Exhilaration in my absence. So glad to have Megan starting us off! Hi there! My name is Megan and I blog over at Chasing Pradas and PR about navigating this pretty little thing we call “adulthood” while hustling after your career dreams and enjoying the occasional glass of wine. I’m ecstatic to be sharing something with you that I don’t blog about very often – my love for travel. I love reading Caitlin’s blog and being able to see all of her amazing travel photos (Santa Fe, anyone?) because while I feel extremely lucky to have traveled as much as I have, there is still so much more I want to explore! My first real taste of adventure was in August of 2004 when my parents took me on my very first cruise, Monarch of the Seas by Royal Caribbean. Since then, I’ve been back to the Caribbean five times and visited nine different Caribbean islands. Last year, when my boyfriend and I cruised together, he traveled outside the country for the first time! It seems like ever since we’ve both been severely bit by travel bug and itching to go back. 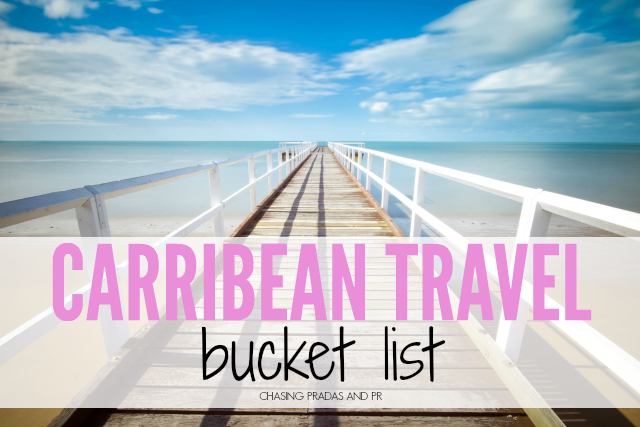 We’re either talking about vacation, dreaming about vacation or planning a vacation back to the Caribbean… so, I wanted to share items growing bucket list for traveling the Caribbean! Interact with real pirates. You can call me crazy (and this probably isn’t the safest idea I’ve ever had), but I’ve seen “real” pirates twice while on jet ski tours in the Caribbean Islands and they have always mystified me. Chop open a coconut with a machete in Nassau. One of my favorite memories is from my senior year of college where we spent the day at the little shack bar on the public beach in Nassau, Bahamas. Watching the local men wield a machete to create instruments and cups from fresh coconuts kept my interest for hours! Take on the legendary Atlantis Resort water slide. I am a chicken when it comes to heights, but between the view and the adrenaline rush – the experience would be worth every second of fear. Snorkel under the sea in St. Maarten. Last year, I went snorkeling for the first time in Nassau, Bahamas. It was by far the best on-shore experience I’ve ever had on a cruise. I’ve heard the snorkeling is insane in St. Maarten and am looking forward to the amazing underwater views the next time I visit. Crash a private beach. In St. Thomas, beach access isn’t accessible right when you get off of the ship. Our group decided to hail a cab and ask him to take us to his favorite beach – little did we know it was a private resort! Besides the risky decision to crash a private beach, we had a great time on our secluded piece of paradise. Attend Stanford Antigua Sailing Week. Not only has Antigua always been on my list of destinations to visit because of its majestic beauty, but it’s also home to one of the world’s top sailing regattas. People from all over the world gather for this race and to celebrate Antigua’s beauty. Experience a whale migration in Grand Turk. Turks and Caicos has always been among one of my top 5 places to visit. And whale watching? If I don’t have to go to Alaska and face the cold weather (sorry, Caitlin!) to do it, I’m sold! Get a “local” tour from a cabbie. This is hands down my Dad’s favorite thing to do in every foreign city he visits and while I didn’t always understand his reasoning for doing it when I was younger, I definitely get it now. Riding along with a local for a behind-the-scenes tour of town may not take you to the touristy sites, but it will highlight all of the places that are sacred and important to the residents of the place that you’re visiting. Spend a week in St. John. Out of all the Caribbean destinations I’ve been to, I haven’t been lucky enough to visit St. John’s, Antigua yet. Everything I’ve ever been told about the culture and hospitality screams luxury and makes me want to spend a lifetime week there.